Disclaimer: I have used the build for only a few hours and only in a VirtualBox VM. This is not an in-depth review but rather a superficial listing of what I have found so far while clicking through the system and making it ready for more frequent use. Everything that I complain about I also reported using the Windows Feedback application. Installation was flawless and worked as expected and already experienced several times with Windows 7 or 8. After logging in with my Microsoft Account, the lock screen used the picture I had set on another computer, the accent color was set (although in a darker hue) and the taskbar was pinned to the left, just how I like it. So far so good. The first thing I did was to setup OneDrive sync and let it keep track of all of my files and folders. Because I stored the VM file on my HDD instead of the SSD, I could hear the load OneDrive sync put on the drive. It could also be noticed in the responsiveness of the VM. The hard-drive is no slouch, but it really had problems to keep up with the load of the sync. This went so far in that installing Windows updates at the same time basically did not progress at all. The good thing about OneDrive though is, that it seems to immediately sync changes. This only works on my Surface Pro 3 but not on my desktop. There I have to trigger syncs manually. The most notable things Windows 10 offers are modern apps side by side with Win32 apps and virtual desktops. 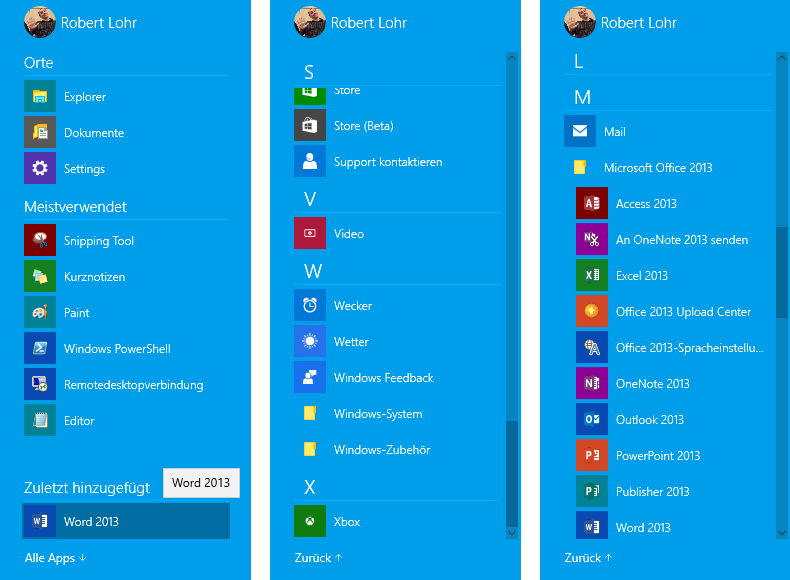 Did you expect me to mention the Start Menu as part of that list? You should know better by now. If not, please read my Windows 8.1: One Year Later post. Don’t worry, I’ll mention it a little later. The desktop still works as one is used to, with the exception that modern application now open as windows on the desktop. That means you can open a PDF file, e.g. an e-book about software development, and type your code into Visual Studio without switching between the full screen modern PDF reader and the desktop where your IDE is at home. But not only that, with the concept of Universal Apps this may actually improve the app ecosystem on Windows 10 desktop and phone/tablet. This a topic for another time though. Snap assist is a neat thing as well, so are virtual desktops. I have used them on Linux systems as part of my workflow and I’m eager to see them in action on Windows. For now I cannot really report anything on any of the two as I’m yet to decide how and when to best test that. 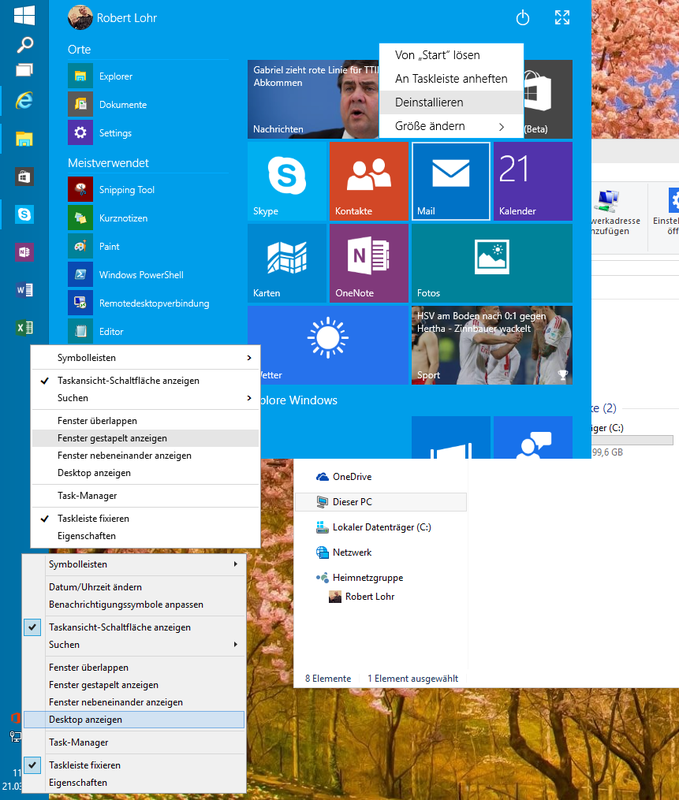 A very obvious change in the design are the extremely thin borders around windows. I really, really love that. This reduces the unnecessary clutter by so much and, at the end of the day, even gives you a few more pixels of content in your applications. It makes for a much cleaner look. Unfortunately not all things are good. While installing Office I have noticed three sets of title bar styles, the modern applications, the native applications and Office’s own style (in that order). What’s even worse, the native title bar’s system menu looks totally off. When you use the mouse to hover over an icon the highlight and the glyph are not always aligned properly. The maximize icon is not centered in the highlighted state. Next on the list of random user interface designs is the nearly endless list of menu styles. Modern applications have a new menu to replace the charms, which also has its own theme. The same theme is used for Cortana, but slightly different still. 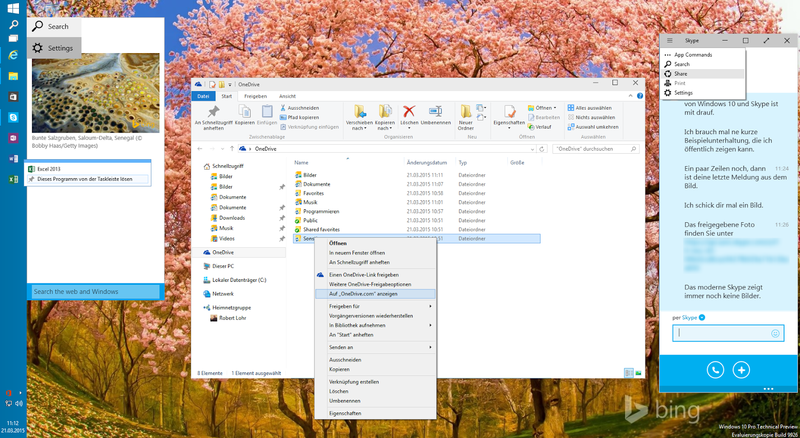 Then there’s the known context menu of native applications like the explorer or the taskbar, but the latter even offers two different ways of drawing it, depending on where you right-click. And then there’s the Start Menu of course. I had to make two images to include all of them. There’s still a lot of work ahead of Microsoft. 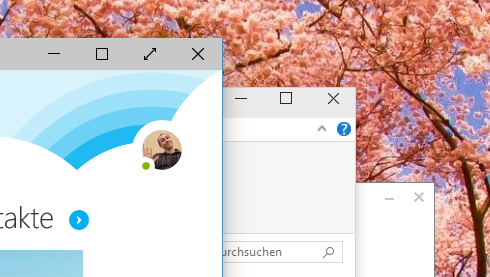 I hope they settle with the lighter version of the taskbar and add a bit more color (maybe the accent color?). Only gray looks dull. Disclaimer 2: It’s important for you to know that I am not testing this on a real tablet! Things I describe may only be because Windows 10 detects a mouse + keyboard based hardware. But I have watched a few videos on YouTube and those confirm my experiences (they use the previous build however – video 1 and video 2). Let me get straight to the point: I don’t like it. It basically looks like an always-maximized mode of the desktop. What I think is a good idea is to use the Start Menu and make it full screen to be the Start Screen. What I think is a bad idea is that it is just a full screen version of the Start Menu, with the list of applications still being displayed as well as the taskbar. Do you see that? Because of the taskbar, the apps list and the transparency the once clean Start Screen of Windows 8.1 is now polluted with crap I don’t want on my tablet. Desktop applications also show the title bar whereas it is hidden for modern applications. I can see the value in allowing desktop apps in tablet mode but please, please make it more consistent. This is the same thing as with the different styles of title bars or menus. It’s the little details. The other annoying thing is: why aren’t my tiles arranged as on my other devices? I spent some time doing that so that it works for me. Unfortunately the animation we are now accustomed to when opening a modern app in tablet mode is gone as well. You tap/click a tile and then it is just there, full screen. Not a nice experience. 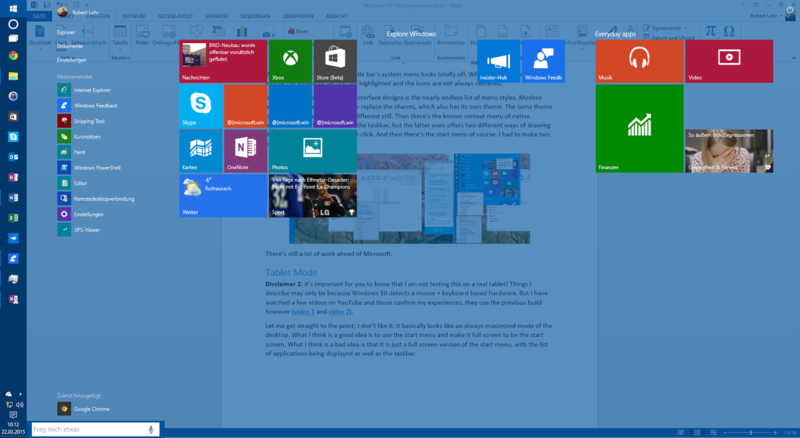 You can also minimize all apps – hide the Start Screen even – they have a menu after all, and see the desktop and the icons on it. You just can’t interact with it. Why show it then? Now that the list of installed applications is back and nicely sorted alphabetically and grouped into sections, why can’t I tap/click on a letter, like on Windows Phone 8.1, and be presented with a list of letters for which apps are installed so that I can quickly jump to that section? The Windows 8.1 app screen may have been cluttered but it showed a lot more on one page than this Start Menu. How about the jump lists? Gone. The live tiles are a nice touch though. This really pushes modern applications and may lead to a wider adoption and use, just because a live tile shows some interesting information that users have missed so far because of ignoring the modern environment to the death. I ran into an odd situation that would have never happened on Windows 7 but did on 10 because of how I was used to Windows 8.1. After installing the Office suite, the Start Menu showed that a new application (only one of the many) was available. I could have clicked it there and then but I went to find it in the list of all applications and didn’t. I was looking for “Word 2013” in the section for letter “W”. When I couldn’t find it I looked for “Excel 2013” and had no luck either. After a short pause I figured that Office may have installed its Start Menu shortcuts in a sub-folder, which it did. The thing is that the icons for folders are small compared to the app-icons and so I completely missed it scrolling through the list. There’s a lot to like for desktop users, I like it too, but not a lot for those people that use Windows 8.1 on a tablet and are happy with it. As of now, this looks like a typical Microsoft development where a certain portion of Windows users cried very loud and the company does a full 180 to try and please them and in turn breaks something that is actually pretty good. I know some of those people and I read a lot what the Internet has to say and to me it’s just laziness to adapt to something that is different and see the merits of it (Vista anyone?). Granted, Windows 8.1 went a bit too far, but some people are just narrow minded. Sometimes you have to make a big step to drive innovation. Just look at Apple. They just announced a laptop with only one port. Now everybody is making fun of it, as with the MacBook Air all those years back, but future versions of this will just be the new Normal. Windows 10 is still in its very early stages and a lot has changed since the first public release and a lot will certainly change until it is final. I hope they bring back some of what made Windows 8.1 great on tablets. I don’t see a reason why this wouldn’t work. With devices like the Surface family the hardware is now ready for software like Windows 8.1. It’s time for the users to follow suit. I’d summarize it like this: Windows 8 broke the desktop workflow of Windows 7 and the current Windows 10 build breaks the tablet workflow of Windows 8 while improving the desktop. I’m still positively curious how this evolves.